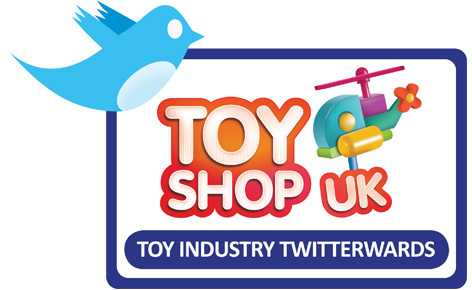 We're delighted to unveil the winners of our first ever Toy Industry Twitterwards, designed to celebrate the best use of Twitter by toy retailers, suppliers and commentators. Halesworth Toys was a popular choice for Best Toy Retailer on Twitter because of their humorous insights into the day-to-day running of an independent toy shop. Thierry Bourret, the gregarious frontman of Asobi toys seemed to touch a chord with toy industry followers last year with his Slow Food-inspired Slow Toy Movement. Thierry utilised support on Twitter to give this movement traction and momentum. Toyology received an impressive number of votes from all quarters of the toy industry for his witty mix of news, views, reviews and videos. Peter Jenkinson of Toyology said: "In order of wins this one definitely usurps my junior discus gold and will remain in top slot until five numbers plus the bonus ball pop out." The Toy Industry Twitterwards took place in January 2012 to celebrate those within the toy industry who had proved to be educational, inspirational or just plain funny in the Twittersphere over the last 12 months. Anyone with a connection to (or interest in) the toy industry was welcome to vote. An impressive 300 nominations were received over a 7 day period and three winners were chosen in the categories of Best Toy Retailer, Supplier and Commentator. 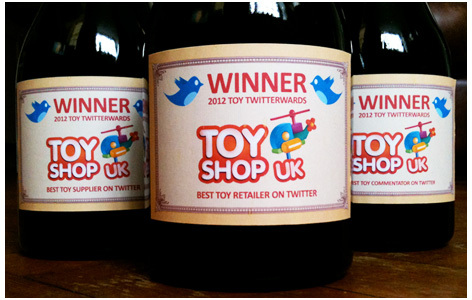 Each winner was awarded a Twitterwards-branded bottle of Champagne.